I know it’s been a while, and I hate to disappoint you, but this is not a revolutionary, inflammatory rant on the slackers of the fire service. This is a simple, benign, and unbiased product review. Before I delve into this new territory for ELAFF, I’d like to post a quick disclaimer on our reviews. The products we review are sent to us, free of charge, by the manufacturer. We may, or may not, be allowed to keep these products after the review is published. We will be as open as possible about the circumstances of each review, but rest assured that we will receive NO compensation for anything written about a product…other than possibly keeping the sample. We will be open and honest about our opinions of the product, be they positive or negative. That’s the short-hand version of it, so on with the review. The Westsider Front Holder is a replacement for the eagle/beaver/solid piece of easily bent metal which holds the leather front/shield on a traditional helmet. They are made by Jonathan Nixon, a firefighter with the Charlotte, NC Fire Department. As stated above, the front is made of aluminum diamond plate. 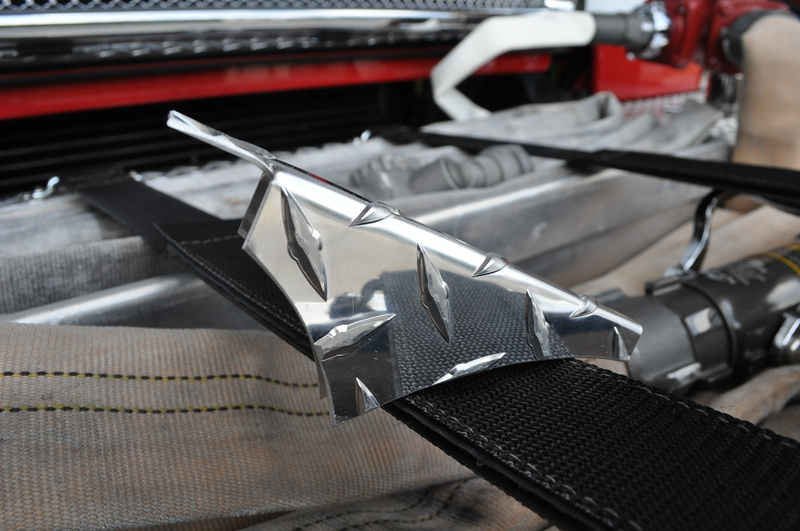 There seems to be a huge number of “diamond plate fans” in the fire service, just as there are leather-freaks. I, for one, am not one of those fans. I simply don’t like flashy “bling” on my helmet, however this review isn’t about my cosmetic preferences, so I showed the front around ELAFF HQ. There were plenty of “oohs” and “ahhs”, and “how do I get one” was asked multiple times. I took this as a sign that firefighters would want one of these on their helmet and began the mounting process. The front comes without pre-drilled holes, so it can be easily mounted on most traditional helmets. It is DESIGNED to be mounted on a Cairns N5A, N6A, 1000, 1010, or 1044. I was planning on being rough with my sample, so I mounted it on an old Ben Franklin I (that’s the good model, not the new Ben II Plus thermo-plastic one). This helmet was a little shorter than the front holder was designed for, and the leather front was a bit tall, but I managed to get the Westsider secured. I wore it through on all runs, including a few fires. It also had plenty of drill time, along with a few training fires. It held up just fine, as I would hope. For the final test, I used the remains of a sprinkler demonstration rig. I decided to punch a few holes in some drywall and bang on the wall studs a few times. Honestly, I wouldn’t expect anyone to punch through a wall using their helmet unless they ABSOLUTELY had to…we carry tools for those tasks. However, I hadn’t yet inflicted any real damage to the Westsider, so I thought I’d give this a try. The drywall didn’t faze it, but pounding on the studs caused the front flap to lift up. I attribute this to the aforementioned under-sized helmet/over-sized shield issue. If I had been using a smaller shield, or a Cairns helmet, I do NOT believe this would have happened. As for the rest of the Westsider, it didn’t have a dent on it. If you DO manage to dent or deform one of these, you’ll probably want to look at replacing the entire helmet…not just the Westsider. This definitely held up better than the stock front holder, which was bent beyond recognition when I removed it. With the trial phase complete, I was left with one last idea. Getting rid of that shine. 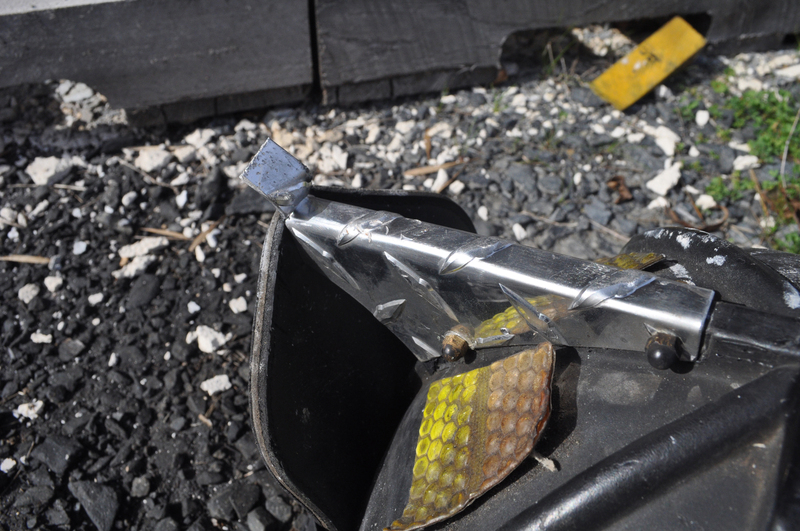 It was easily covered with a liberal coating of “NFPA compliant”, black “rattle-can” paint. You could just as easily use any other color. There you have it. Whether you are a fan of shiny things, or not, the Westsider Front Holder is a viable option for replacing the worn-out, factory holder on your helmet. The diamond plate is strong and looks great, and can be customized easily to match your style. Maybe Jonathan will even start putting out his own colored versions. You can find out more, and purchase the Westsider Helmet Front, on their Facebook page.